Driving Lessons Oxford, We Want You To Pass First Time! "I will learn to drive this year, I will pass my driving test, I will be free :-)"
Assessment Lesson Now Only £65! #Best Car Insurance for Young Drivers 2019!! This service is also available in Welsh (Cymraeg). If you already have a provisional licence, you do not need to apply again to drive a car. Before you startIt costs £34 to apply online. You can pay by MasterCard, Visa, Electron or Delta debit or credit card. You’ll get a confirmation email from DVLA after you’ve applied. You might be asked to take part in research by email, but you can opt out. Your licence should arrive within one week if you apply online. It may take longer if DVLA need to make additional checks. When you can drive with a provisional licenceThere are different rules depending on your age and the type of vehicle. Check what vehicles you can drive and when before you start to learn. Other ways to applyYou can apply by post. Fill in form D1 available from the DVLA form ordering service and certain Post Office branches. It costs £43 to apply by post. Make your cheque or postal order payable to DVLA (do not send cash). You must send original documents. Your provisional licence should arrive within 3 weeks. Contact DVLA if it has not arrived by then. Find out more about our Intensive Driving Courses. Book your Assessment Lesson Now . Get started with Your Driving Theory For FREE now!!
" So, 8 instructors, and 2 cancelled tests later ***I PASSED MY DRIVING TEST***!!!! All thanks to Marco Polo-Oxford and to Pandy Peacock Stoop for recommending the best instructor ever!!!!!!!!!!!!!!!!!!! THANK YOU SO MUCH MARCO! Could not have done it without you!!!! " Our focus is to help you meet the standards of passing the driving test and while using our services we will never shout or become impatient with you. 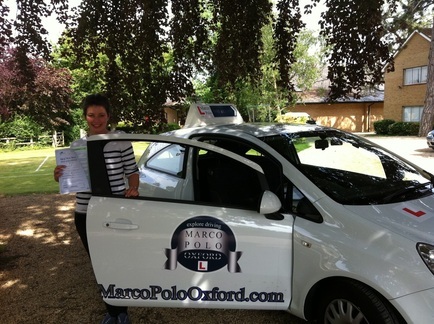 Marco Polo has a fantastic reputation since starting driving lessons in Oxford and would love you to join our success story. Have a great time passing your driving test and we hope you choose us. It would be great to see you on the road with your driving licence.